This post is about beauty and as a bride to be, certainly, you want to look impeccable not only on your wedding day. Below you can find 7 tips and tricks, The Bridal Project' s team has put together during a private makeup class with MACA SOTO. Maca is a renowned Venezuelan makeup artist, based in Miami, whose clients include; Chiqui Delgado, Sasha Fitness, and Michelle Lewin. She is a real professional and will bring out the natural beauty in every woman. TBP brides, she will make you shine. HYDRATE YOUR SKIN - Especially in summer, the warm weather dries out your skin. It is necessary to hydrate and prepare your skin before applying makeup. Look for water boosting products, don't go for the heavy base but instead for a gel. And of course don' t forget to drink a lot of water. PREPARE YOUR SKIN - Always start with a primer for a flawless canvas. It will prepare the skin and will help your makeup stay on longer. CHOSE THE CORRECT COLOR - Choose the base, corrector, and powder according to the color of your skin. Match the color to the tone of your neck, chest, and forehead. Discover what color suits you best; yellow-orange based. Once you find it, stick to it in all of your base products. GET YOUR SKIN BRONZED - Give your face a little touch of sun. With a large brush apply your bronzer or contour to the hallows of your cheek, on the upper forehead, and on your chin. Use preferably a matte bronzer, so that your face does not look too shiny. LET YOUR SKIN GLOW - Use the illuminator for the upper areas of your face, to get a more natural look. Do avoid applying it on your T- zone. Apply instead right on your cheek bones, possibly on your nose to make it look straighter, and slightly under your nose and chin to make the lips look bigger. LESS IS MORE - If you want to go for natural beauty, forget the smokey eye look. Instead, use lighter and natural colors which go well with your skin tone. 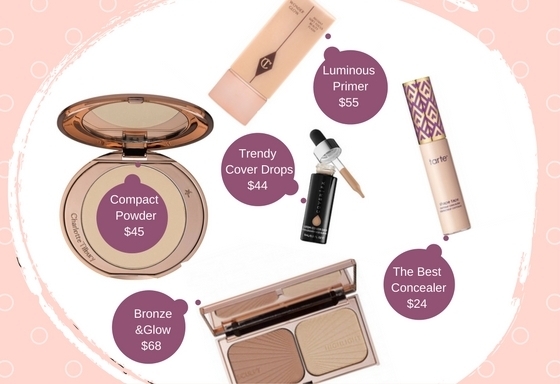 Bring your makeup to a perfection by using an illuminator, bronzer, and perfect eye brows. USE TRENDY COLORS - Metallic colors are in, so have fun with them. Karat gold, true pewter, copper rose or aged bronze? Tell us what is your favorite and don' t forget less is more. We have also put together a selection of products we absolutely LOVE and think you too should try. Contact us for more information or if you are interested for a private makeup session. TBP Brides you won't regret it! great news for all boho-chic and hippie-chic brides, who are free-spirited and who love lace. Gather your family and friends and listen closely. A collection that all of our non traditional, bohemian, unique brides have been waiting for, has come to Miami. We are happy to announce that our showroom will be carrying a unique selection of YolanCris bohemian wedding gowns and accessories. This boho chic collection has been inspired by 70's fashion and boho folk trend and will be exclusively available at The Bridal Project Miami. If you have yet to come across the brand here is a bit of information to keep you in the loop. YolanCris is based in Barcelona and specializes in haute couture wedding dresses and evening wear. This is a brand owned by two women who are sisters. In 2005 they decided to bring their dream to life. This is when they created their brand and turned towards natural and authentic women. What is unique about the brand is that every design and YolanCris creation is hand-crafted and created with high quality European fabrics. To add to the uniqueness, every detail is studied minutely with passion. If you are the kind of bride who loves change and is not afraid of going above and beyond what bridal is “suppose” to be. Well then you are the bohemian chic bride, you are YolanCris bride. Be sure you are part of our newsletter, as we will be announcing a YolanCris Trunk Show soon. Here you can get more information about our unique selection of YolanCris wedding dresses. The images above toke place at The Modern Bride fashion Show. Hosted by The Gibson Guitar. Featuring Maria D'Ocon latest collection. With special LIVE performance by Juan Felipe Samper. Thank you to all Sponsors involved: MG Events, Xixón Spanish Restaurant, Estrella, Barton & Guestier France, Core Hydration, Gannon Events, She is She, Shanin Arce, Tolga Kavut, Style Saves, Brooke Sealey, Yasmin Barroso, Aaliyah Tee Mua, The Suite Spot, Zoe G.